I've never been a fan of eggs. As a baby, I'd spit them back at my Mum or hold my mouth so tightly shut that no spoon had a chance of entering - as a child, I'd gag at the smell of fried eggs - but as an adult? I gave them a little bit more of a chance. I've always used eggs in cakes and baked goods - but the idea of eating anything that remotely resembled eggs in looks or texture totally skieved me out. Crepes? Nope... Frittatas... Nope... Now, they're two of my favourite dishes. Whilst I still despise eggs on their own (think, fried eggs, poached eggs, boiled eggs) due to their "eggy" flavour, I've actually come to appreciate them. When I told my Mum I was going to try making these crepes, she knew I loved the Apple Cinnamon Crepes, but she thought that savoury crepes would be an epic fail and too eggy for me - but I absolutely love them and I've made them dozens of times since the first time. Whilst they don't contain any flour and use a whole egg, a little bit of egg whites and a touch of greek yogurt stop these, what we call, "Omelette Crepes" from having an overpowering eggy taste. 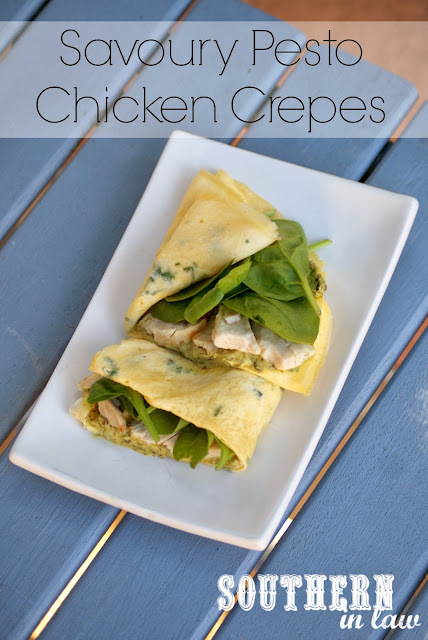 Plus, when you fill them with a creamy pesto spread, baby spinach leaves and roasted chicken breast - you've got an absolutely delicious combination. Mix together your crepe mixture and set aside. Heat a crepe pan or medium sized non-stick frypan over a medium-high heat, lightly spraying with oil spray or lightly greasing with some butter on a piece of paper towel. Pour on about 1/4 cup (or half of your crepe mix) of crepe batter onto the pan, moving the pan around to evenly spread the crepe mixture across the pan in a thin layer. Meanwhile, quickly mix together your cream cheese and pesto and set aside. Leave your crepe to cook on the other side for about a minute before placing it on a plate and repeating the process with the other half of your crepe mixture. 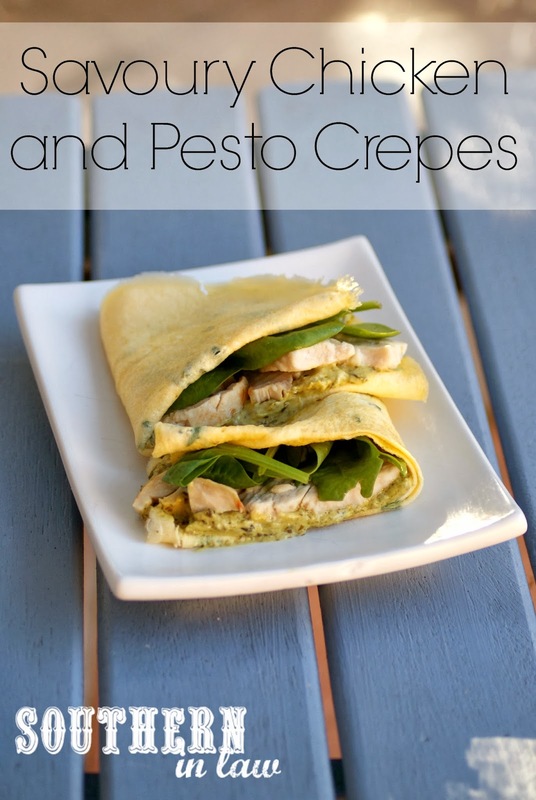 Once your crepes have cooked, add your fillings - you can either roll them up wrap style or fill them the way we've pictured them by folding your crepe in half, spreading the pesto mix on one half, adding all of your fillings and then folding in half again. When we're making a large batch, we'll keep the finished crepes in a warm oven to keep them warm, however, if it's a small batch just eat them right away! But tell me, are there any foods that you hated as a child but love now?